A look at the world's oldest breed of purebred horse. The Arabian horse embodies the history of nations and the growth of cultures, and has had an impact on nearly every other horse breed in existence today. To look at the Arabian is to see more than the beauty of its expressive eyes, dished face and refined features. It is to realize the magnitude of the contribution this one breed has made to the horse industry and the world overall. Perhaps the Arabian’s legendary history is part of what has contributed to its popularity. “The Arabian horse was used as an ambassador and was often given as a treasured gift to royalty or important political figures,” says Susan Meyer, vice president at large of the Arabian Horse Association, vice president of the Arabian Jockey Club and a trustee of the Purebred Arabian Trust. She and her husband, Jim, have owned and operated Meyercrest Arabians in North Carolina for 39 years, and have owned, bred and shown horses to championships at the local, regional and national level. They have also owned, bred and raced purebred Arabians across the United States. 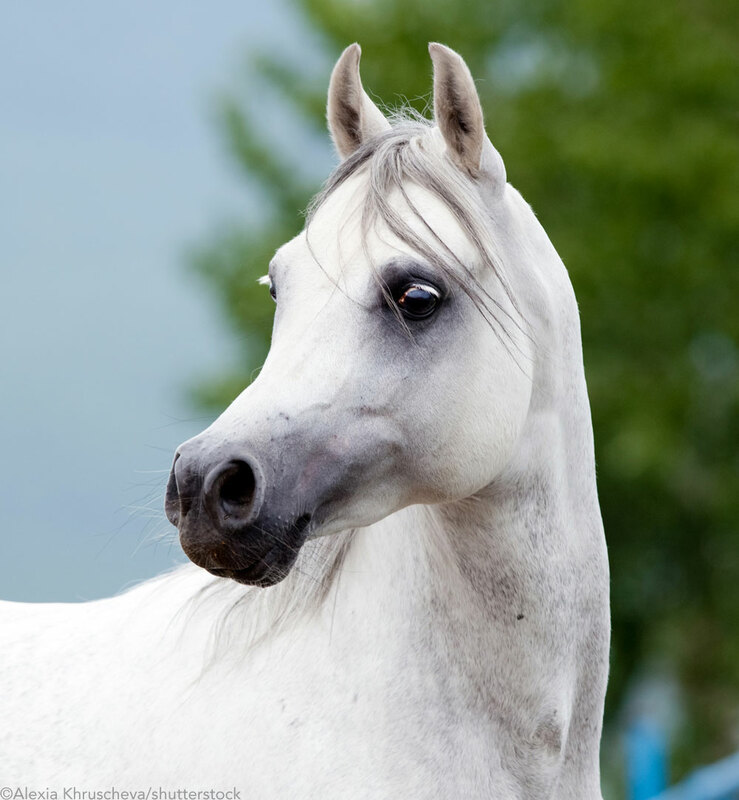 Despite the Arabian’s long and alluring past, it’s incredible that the breed has remained so true to its original physical traits, and that it has been able to perpetuate those qualities for so long. Although the specific area of the Arabian Peninsula where the breed originated can’t be pinpointed, it is widely accepted that around 2500 B.C., the Bedouin people were responsible for developing the desert horses that became the ancestors of the Arabian horse. The nomads’ keen horse sense and meticulous attention to proper care and breeding created an animal that could withstand the harsh environment of the desert, surviving extreme heat and cold with little water and the food they shared with their handlers. A life of travel also required horses with great lung capacity, endurance and stamina. Many of the Arabian’s characteristics have an ancient religious or superstitious belief attached to them. These traits were highly sought after and became the focus of the Bedouins’ selective breeding practices. Jibbah: The bulging forehead was considered a blessing from God. The Bedouins believed that the larger an Arabian’s forehead, the more blessings he brought with him. Mitbah: The area where the head attaches to the neck—behind the ears along the topline of the neck and the throatlatch. The Mitbah symbolized courage. In addition to wealth and good luck, most of the Arabian’s traits have a significant physical benefit. For instance, the short, dished head and flaring nostrils promote optimum oxygen intake. Furthermore, the Mitbah’s long, fine characteristics prevent the windpipe from being constricted when the head is in a collected frame, which promotes the free flowing of oxygen to the lungs at all times. And the deep chest and wide ribcage permit lung expansion. The breed’s Arabian name “Kohl-ani” is a reference to its eyes and skin. The smooth skin is the color of Kohl, a bluish-black substance that was used in Egypt in ancient times as eyeliner and eye shadow. Mares were prized over stallions because they perpetuated the breed. They were also preferred for war because they wouldn’t nicker to the enemy’s mounts during raids. Mares were so valued that they were rarely sold. If they changed owners, it was considered a very honorable gift. The Arabian’s physical traits and ability to pass them on to other breeds became a major force behind its appeal to other societies. About 3,500 years ago, the Arabian helped expand empires such as Egypt and shaped cultures by influencing the horses that were used to settle nations, fight wars and grow economies. When Arabia worked to spread Islam in 600 A.D., the Arabian horse carried Arab warriors throughout the Middle East and as far as North Africa, Spain and China. Through this effort, and as a result of the expansive Christian Crusades during the 11th and 13th centuries, the Arabian horse began leaving its mark on European horses. It added refinement to heavier draft breeds and height to smaller ponies. However, its greatest influence was likely that of developing the English Thoroughbred. Three stallions—the Godolphin Barb, Darley Arabian, and Byerly Turk—are credited with being the foundation sires of the Thoroughbred breed between the late 1600s and mid-1700s. Today, the majority of Thoroughbreds can be traced to one of these sires. In turn, the Thoroughbred added to the influence of the Arabian by passing on the traits it inherited from this ancient horse to many other breeds, particularly the American Quarter Horse. In the 1800s, influential Arabian stud farms were established all over Europe. The historic Crabbet Arabian Stud in England, founded by 15th Baroness Wentworth Lady Anne Blunt and her husband, Wilfred Blunt, produced horses that contributed to the spread of the Arabian breed to Russia, Poland, Australia, Egypt, and North and South America. In the United States, Randolph Huntington started what is considered to be the first purebred Arabian breeding program in 1888. Later, 45 Arabian horses exhibited at the 1893 Chicago World’s Fair inspired further interest in the breed in America. This led to the formation of the first stud book and the Arabian Horse Club of America registry in 1908, now known as the Arabian Horse Association. Subsequent breeding farms and importations in the early and mid-1920s led to further growth of the breed in the United States. Davenport Arabians and Kellogg Ranch, which was established by cereal tycoon W.K. Kellogg, were two of the breeding farms that moved to the forefront of the industry at that time. “In the late 1800s and early 1900s, several wealthy American entrepreneurs became enthralled with the history, beauty, athletic ability and unique human-animal bond that the Arabian horse represented,” says Meyer. “They began importing Arabian horses from the Middle East and Europe. These horses were not only used to cross with indigenous horses, but they were also used to establish herds of breeding stock to preserve a source of purebred Arabians here in the United States. An unfortunate result of this boom in the U.S. Arabian population was a severe downturn in its popularity during the 1980s. Changes in the economy and indiscriminate breeding gave rise to misconceptions that left reputable breeders and promoters disheartened and struggling to pick up the pieces. A new focus in the 1990s on ability and promoting the Arabian as an all-around performer and family horse helped launch a resurgence for the breed. Because of this, Arabian owners enjoy participating in various equestrian sports today, from reining to dressage. The breed particularly excels in endurance and trail riding. The Arabian also continues to fight an enduring misconception about being high-strung, which has a lot to do with the breed’s past, says Meyer. “The most prized horses of the Bedouins were the mares that were used in raiding other tribes,” explains Meyer. “A mare not only had to be unfailingly loyal to her master, but she also had to be fierce and courageous in battle. The uninformed can believe Arabians are naturally aggressive, when in fact, these traits are learned behaviors. 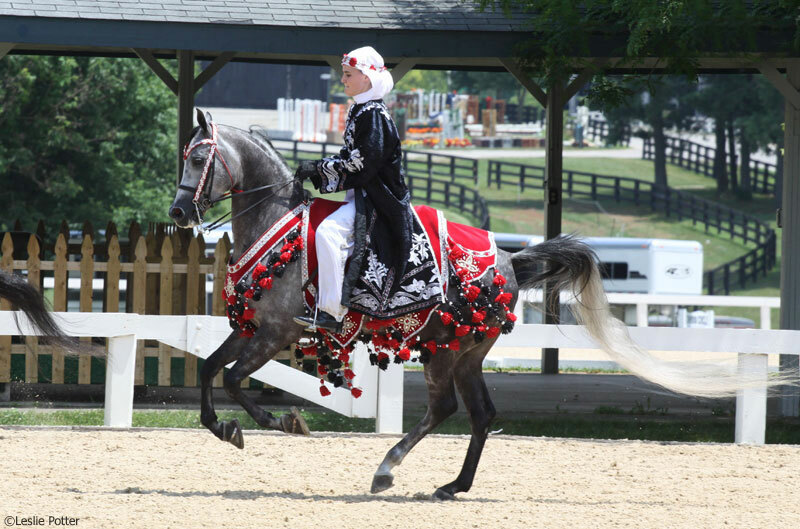 With so many qualities to admire about the Arabian horse and an exhibit such as the Arabian Galleries to promote it, the breed can look forward to maintaining its popularity in the horse community, according to Meyer. Meyer believes two trends that have made their way into the Arabian horse industry will propel the breed into a successful future. Meyer says another trend that has secured the Arabian’s top position in the horse industry is the baby boomers’ growing interest in riding, and their desire for suitable mounts that are both athletic and reliable. 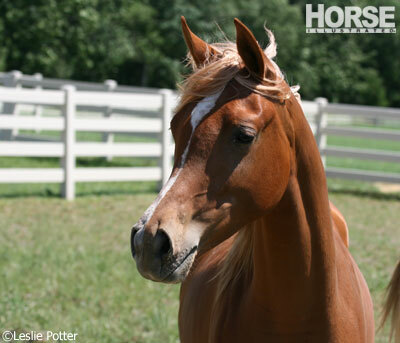 This article originally appeared in the January 2011 issue of Horse Illustrated. Click here to subscribe. I’ve wanted a white (gray) Arabian mare for 10 years!